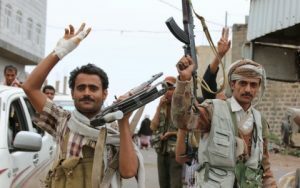 The Saudi-led coalition has rejected a ceasefire proposed by Saleh Al-Sammad, head of the 10 member governing political council, established by the Houthis and their allies in August. The coalition spokesman Maj. Gen. Ahmed Al-Assiri stressed that “if they (rebels) want to have a ceasefire they know what they have to do” making reference to the disarmament of the rebels and the handing over of seized territories. Several ceasefires have failed with both sides accusing each other of violations. The latest negotiations for a ceasefire that was supposed to pave the way for a political transition were held in Kuwait but they faltered as the Houthi Movement refused to sign the ceasefire agreement that it deemed partial because its demand for a joint transitional government was not part of it. Kuwait’s Deputy Foreign Minister Khaled Suleiman Al-Jarallah said they are ready to host the warring parties again under the auspices of the UN represented by its Special Envoy Ismail Ould Cheikh Ahmed. “The State of Kuwait has always been supportive of all efforts aiming to resolve the Yemeni crisis peacefully, including the efforts of brothers in the Kingdom of Saudi Arabia”, Jarallah stated. Meanwhile, former Yemeni President Ali Abdullah Saleh wants direct talks with Riyadh in order to reach a peace deal in the war torn country. Saleh was forced from power under the wave of the Arab Spring. Posted by Jaber Ali on Sep 27 2016. Filed under Gulf News, Headlines. You can follow any responses to this entry through the RSS 2.0. Both comments and pings are currently closed.